In Thinger.io, you can use data buckets to store and export any time-series data from your IoT devices. At this moment, the platform allowed to use this information in a web dashboard, or export the information in CSV format for offline analysis. In our experience with some research centers, we have learned that CSV format is great, as it is quite standard, but the timestamp information provided by the platform (unix timestamp) was not quite useful or standard, at least without having to code a little. So, we have worked in the export system, and now it is able to export the informations in different file formats, with different timestamp encoding. These new formats simplifies using the information for its analysis, and, for example, the ARFF file can be used out of the box with the Weka Data Mining Software. So, you can import your data bucket without any conversion process. The following screenshot represents real data captured by a Sigfox device during some months, and its plotting temperature vs humidity. 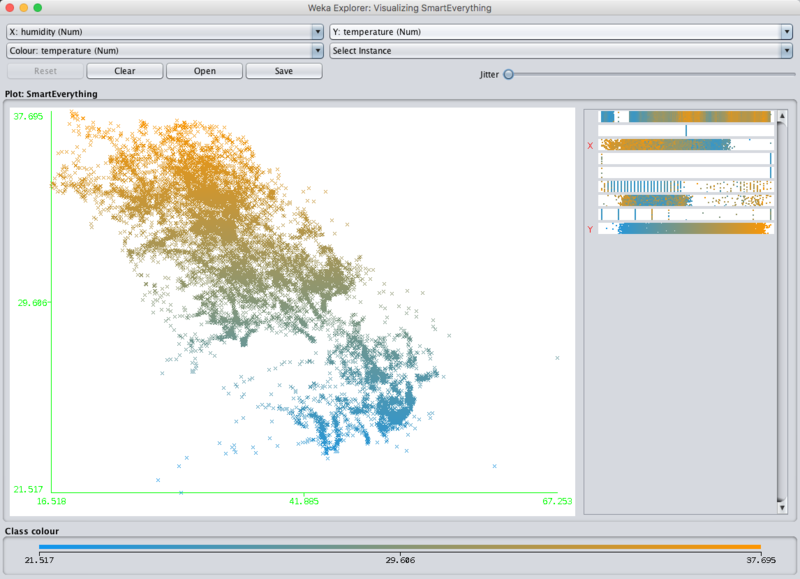 You can use Weka to build classifiers, create time-series forecasting, or any other data mining process. Did you find this new feature useful? Are you planing to use you IoT in some data mining process? Let us know!